I found the cookie cutter at www.cheapcookiecutters.com. 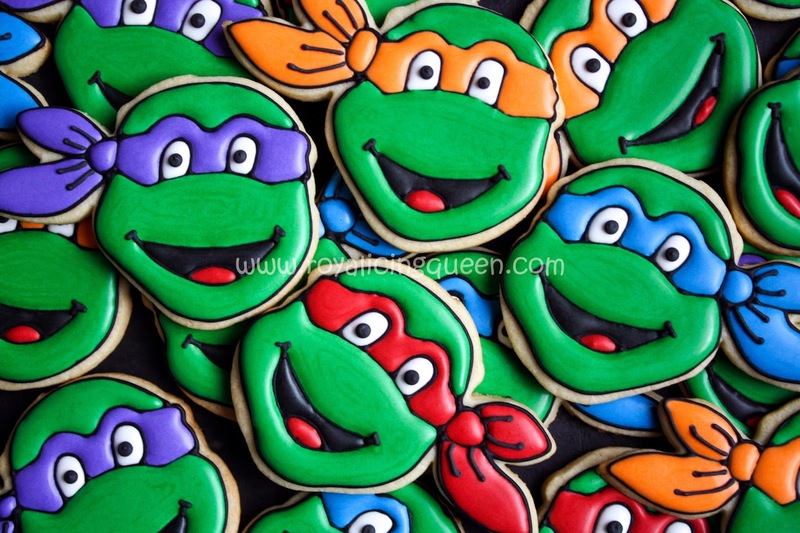 I outlined the turtle faces with black royal icing first and then filled in the spaces with the appropriate colors. I found that using a slightly larger tip (Wilton #2 or #3) for the black outline to make it a bit thicker worked best. I tried using a smaller tip first, but the colors ran over the outline and into each other more easily because the outline was too thin. After I had filled in the colors inside the outline, I used my oven trick to quick-set the top of the icing. I added the black pupil of the eye and the details around the mouth (smile lines at the corner) and bandana (crease marks) last.